Have you noticed that when adversity strikes in our life, we tend to reflect inward to find the strength and courage to carry on. We seem to know that deep inside our spirit is a reserve of moral fortitude waiting to rekindle our energy for creative solutions to move us forward to greater harmony and peace in our lives. For many of us, including myself, that moral fortitude comes from the values that we learned in childhood. My grandmother’s kitchen was full of love, good music and good food, nourishment for both the body and soul. My grandmother loved to listen to classical music on the radio, especially the Saturday afternoon Texaco Metropolitan Opera broadcasts. She would sit me on her lap and sing along with the familiar Puccini, Mozart, and Verdi arias. Music brought harmony into her life and music washed away the troubles of the day, family and financial. On my 10th birthday, my grandmother gave me the gift of music lessons. I got to choose a musical instrument and take weekly lessons in the Albany, NY elementary school music program. 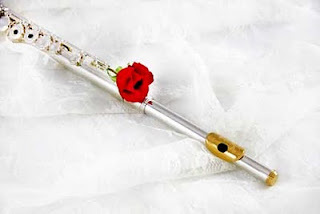 I chose to take flute lessons. Classical music was in my heart, thanks to those kitchen table experiences at my grandmother’s house. Classical music and flute playing became part of my core values for life. Throughout my high school years I was blessed by having a caring band instructor, Luke Matthews, who encouraged my musical ability and helped me settle on a career in music. I was fortunate to receive a work scholarship to Boston University School of Music. I graduated and taught music in a small New England town for one year, but like most young women of my generation, my life and career took other paths. I packed away my Haynes flute, bought in 1961 by my folks with a loan on Dad’s insurance policy, and went on with life in nonprofit management and fundraising. Twenty years later I moved to Florida with my old flute and new husband. Several years later during the Thanksgiving holiday season, Dad, who had been quite ill for many years died, and I found myself getting a divorce. But I still owned my flute. Over the years, I would take it out of the case when I felt discouraged and I would play my favorite music to console my soul. Memories of my grandmother’s kitchen and her joy of music made my heart sing. I now live in a town with a pretty good-size community band, so a few years ago I sent my 40-year-old Haynes flute back to Boston for an overhaul to remove the dents and replace the pads. When I got it back, I practiced a bit more and went down to the community center and auditioned for a seat. I got in. When I am not traveling for work, you will find me on a Monday night at band rehearsal, forgetting all the troubles of the day and soothing my soul playing a Souza march or a Broadway musical overture. Recently, I went through more of life’s adversities, including the death of my Mom. I found myself once again lamenting and releasing my grief with my music. I realized that my childhood love for harmony, beauty and classical music in my life were values I wanted to pass on to future generations. This was part of my legacy. I wanted other young women to know and experience how the power of music can help get a person through adversity, soften the loss of loved ones, brighten changing economic situations and life-altering situations. To do this, I revised my will and established a scholarship at Boston University, my alma mater, for a female flute student. I realized by getting in touch with my values and becoming more strategic in my estate planning, I could pass on my legacy of values as well as valuables. I could help a musical student start on her musical journey, just as a work scholarship had started me on mine. I could pay it forward. So no matter if it’s mini-money or mega bucks, funding a flute scholarship of leading a cause to stop global warming, we all can make a difference, we all have a legacy, we all can do our part for a more just, harmonious and compassionate world. In my book, Women Wealth and Giving: The Virtuous Legacy of the Boom Generation, I write about the values pyramid, and how values instilled in childhood, become tested and distilled in our lifetime so that when we reach midlife we find the essence of these values guide and direct our decisions in times of adversity. Yes, our childhood kitchen table values have come full circle to help us get in touch with what is really important in how we live our life and how we leave our legacy. Take a moment to reflect on your childhood memories and their impact on who you are and what you do today and tomorrow.